Some LocoNet devices allow users to update the firmware (internal program) via the LocoNet connection. The LocoNet Download Firmware tool provides a mechanism to perform updates via a LocoNet connection. This tool is not used for loading sound projects into Digitrax sound decoders. The Sound Download Tool may be used for that purpose. This tool supports firmware update files distributed as either the ".dmf" (Digitrax Mangled Firmware) file format or a ".hex" file format (sometimes referred to as the Intel "I8HEX" file format). This version of the tool automatically determines how to interpret the firmware update and performs a number of file and data integrity checks before the update information can be used. If any issues are identified in the firmware file, the user is informed and the tool will not allow the user to update the device with what could be erroneous firmware information. This significantly reduces the risk of corrupting the device firmware as compared to previous versions of this tool. This tool is capable of modifying the firmware in LocoNet devices in ways that could make the devices inoperable. The developers of this tool have attempted to reduce the chances that the tool would corrupt a LocoNet device's firmware. We have successfully tried this tool with a variety of LocoNet devices, computers, operating systems, LocoNet interfaces, and firmware update files. We cannot guarantee that there is no risk of corrupting device firmware when using this tool. It is impossible for the tool developers to predict every way of using the tool and it is impossible to predict the nuances of various devices, firmware files, computer operating systems, computer-to-LocoNet interface hardware, etc. In cases where a firmware update attempt does not apply properly, it is often possible to re-apply the firmware update to the device to restore proper device functionality. This has been recommended by at least one LocoNet device manufacturer and has been found to be effective in some cases by the developers of this tool. It is best to perform LocoNet firmware updates with a very simple LocoNet environment, including as little LocoNet hardware as possible. A good choice for a simple LocoNet firmware update configuration would include the device to be updated, a LocoNet-based command station, and a PC-to- LocoNet interface device. A simple LocoNet configuration helps reduce the amount of other LocoNet message traffic that could potentially disrupt the firmware update process. If you plan to re-configure your LocoNet connectivity to perform firmware updates, be sure that you will be able to restore your LocoNet connectivity properly once you have completed the update process. Take notes or make a drawing if necessary. The device being updated must be plugged into a live LocoNet connection. If the device can be battery powered, ensure that the batteries are good before starting this process. If the device uses an external power supply, ensure that it is powered and attached. Some devices may require changes to jumpers or DIP switch settings, and perhaps require removal and restoration of power, in order to allow the device to accept the firmware update via LocoNet. Devices produced by Digitrax which support LocoNet firmware updates do not require any physical configuration changes to the device. Consult the LocoNet device manufacturer's firmware update instructions for details. Open the LocoNet Firmware Download tool by selecting the "Download Firmware" item from the LocoNet menu. If you have more than one LocoNet connection, you must open the tool from the LocoNet menu which is associated with the connection which communicates with the device you wish to update. Click the Select button, and select the .dmf file or .hex file you want to use as the source of your firmware update. Click the Open button to select the file for use. The file will then be read and inspected for errors. If the file is read and parsed successfully, the tool window will enable the "Download" and "Verify" buttons, and update the status message at the bottom of the window to state "Click Download to download new firmware". Only if instructed to by the device manufacturer, change the various values in the Firmware File Properties portion of the display. It is usually not necessary to change any of the values. Once the update tool completes its work, the tool is unable to tell if the LocoNet device has properly accepted the update. This is a limitation of the LocoNet messaging used for the firmware update and firmware verify processes. Because of this limitation, the tool is only able to report that it has completed its work. If you re-configured your LocoNet connectivity for a simplified LocoNet at the beginning of the firmware update process as described above, restore the LocoNet connectivity to its normal state. Sometimes the device firmware update process does not appear to work, and the device may fail to provide its normal functionality. Often, repeating the firmware update process one or more times will solve the problem. This has been recommended by at least one LocoNet device manufacturer and has been found to be effective in many cases by the developers of this tool. As an example, if the firmware in a Digitrax DT402D throttle has been updated and that update was not successful, when the DT402D throttle is powered up, the display will usually show a series of dim, filled-in rectangles rather than the normal power-up display of model and firmware revision information. In this case, re-updating the device, using the process shown above, will usually restore the throttle to proper functionality. Some devices support a firmware "verify" process. This tool can perform the process to send the appropriate LocoNet messages by using the "Verify" button in the tool window. This tool cannot provide any indication of whether the device firmware does or does not match the firmware update file's information because there is no well-defined LocoNet message that conveys this type of information to the tool. Instead, the device may provide the pass or fail results of the verify process, perhaps by a specific blink sequence on an LED or by displaying a message on a display on the device. If a LocoNet device supports the verify operation, the manufacturer' s instructions should describe how the product provides status information for the results of the verify process. This tool can identify problems at two different stages of the firmware update process. The tool checks for problems within the firmware update file when reading the file. When the user activates the "Download" or "Verify" button, the tool checks the validity of the parameters which the user can change in the tool window for obvious problems. If any issues are found at either of these stages, the tool will update the message at the bottom of the tool window. If a parameter is found to be out of range, that parameter value will be shown with red text instead of black text. The "Download" and "Verify" buttons will not perform any useful function if any of the parameters are invalid. When the tool reads a firmware file and can determine that the file requires a process which the tool cannot support, the tool will pop-up a dialog box saying "Invalid Prog Blk Size parameter ...". The tool will prevent itself from attempting to update the device. This applies to firmware updates for some newer Digitrax hardware which requires a different firmware update process. For these devices, the Digitrax DigiIPLII software should be used. With some older versions of this tool it was very easy to read the firmware update file in a way that caused improper interpretation of the information and which could result in corruption of the device's firmware. This version performs several checks of the firmware update file to ensure that the file is interpreted correctly and to identify partial or damaged firmware update files. If any issues are found in the firmware update file, the tool will not allow the user to perform the update process. This should significantly reduce the risk of corrupting a LocoNet device's firmware when using this tool. This tool can send the contents of a firmware update file to LocoNet with a request that the associated device(s) update their firmware based on the contents of the LocoNet Messages. This tool cannot know whether any of the firmware update file information was successfully programmed into a LocoNet device's firmware. The LocoNet messaging protocol does not provide any indication of the status of the firmware update process. This tool can send the contents of a firmware update file to LocoNet with a request that the associated device(s) compare their firmware to the contents of the LocoNet Messages. This tool cannot know whether any of the firmware update file information actually matches or is different from information within the device's firmware. The LocoNet messaging protocol does not provide any indication of the status of the compare. 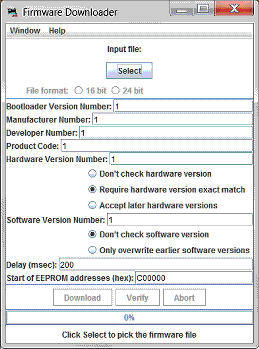 This tool allows the user to change some aspects of the firmware update process, including some information used to identify which LocoNet device type is to accept the firmware update information, as well as some LocoNet timing delays. Changes to the information in the "Firmware File Properties" portion of the tool window should only be made under direction of the manufacturer. Changes to the values could result in corruption of the targeted device OR other devices which may be connected to LocoNet. This tool cannot predict how changes to the information in the "Firmware File Properties" could possibly cause malfunction of any LocoNet device. Changes to the information in the "Firmware File Properties" portion of the tool window should only be made under direction of the manufacturer. This tool does not read the contents of a LocoNet device's firmware. The table below lists some devices which are known to be unsupported by this tool. The tool will not attempt to update these devices because this tool does not implement the correct protocol. Using the protocol implemented in this tool when a newer protocol is required would result in a corrupted firmware image in the device. Use the Digitrax program DigitIPLII.exe to update these devices. The LocoNet Firmware Download tool is similar to the "DigiIPL.exe" and "DigiIPLII.exe" which have been released by Digitrax. "DigiIPLII.exe" is available from their web site as part of the SoundLoader2 package. Support for the DigiIPLII.exe program is provided by Digitrax. Note that DigiIPLII.exe is intended for use with Digitrax products and is not able to perform firmware updates on at least some non-Digitrax hardware. This tool does not receive any LocoNet messages from the device as part of the firmware update process. At the time this tool was written, the firmware protocol does not define any sort of feedback from the device to the programming tool. As such, it is not possible for this tool to provide any definitive indication of the success of a firmware update or firmware verify operation. It is up to the user to determine if the device has been properly updated. This version of the tool does not allow the user to configure the file addressing format. The tool automatically determines whether the file uses 16-bit or 24-bit addressing. This removes the possibility that the wrong setting could be used. This tool cannot be used to update the firmware in the LocoBuffer-II device. It is possible to update firmware on multiple devices of the same type at the same time. If attempting this, ensure that the devices are all actively connected to LocoNet, properly powered, and properly configured before activating the "Download" button. The developers of this tool do not recommend this as any failure of the process could result in all of the hardware being updated becoming unusable. Do not open multiple LocoNet Firmware Download tools at the same time. Do not perform firmware updates and/or verifies from multiple sources (computers) simultaneously, as this is likely to result in corrupted device firmware. If you experience difficulty with this tool and believe that your problem is caused by the tool, seek help through the "JMRI Users" forum at "groups.io". Note that Digitrax does not provide any support this tool. LocoNet is a registered trademark of Digitrax, Inc.